As a kid, I spent a lot of time in the garden with my grandmother. 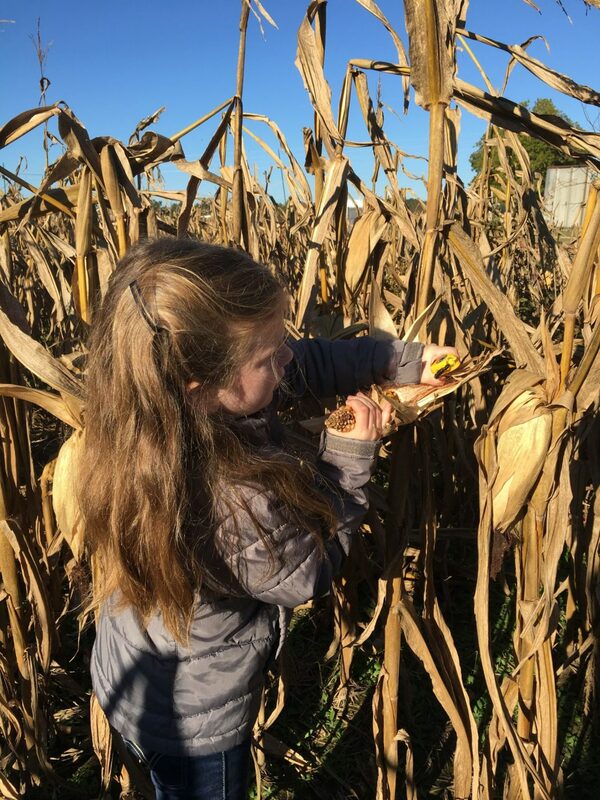 Most summer days you could find us picking peas and butterbeans, digging Irish potatoes or shucking sweet corn. I can still remember watching my grandmother run her thumb down a pod of field peas as they fell into a white plastic bowl that was on her lap. When you sat down at her dinner table it meant something. You knew that everything you were eating was a result of her hard work. On October 30th, a group of Cumberland County Extension master gardener volunteers set out to give the junior master gardeners some of those same experiences. 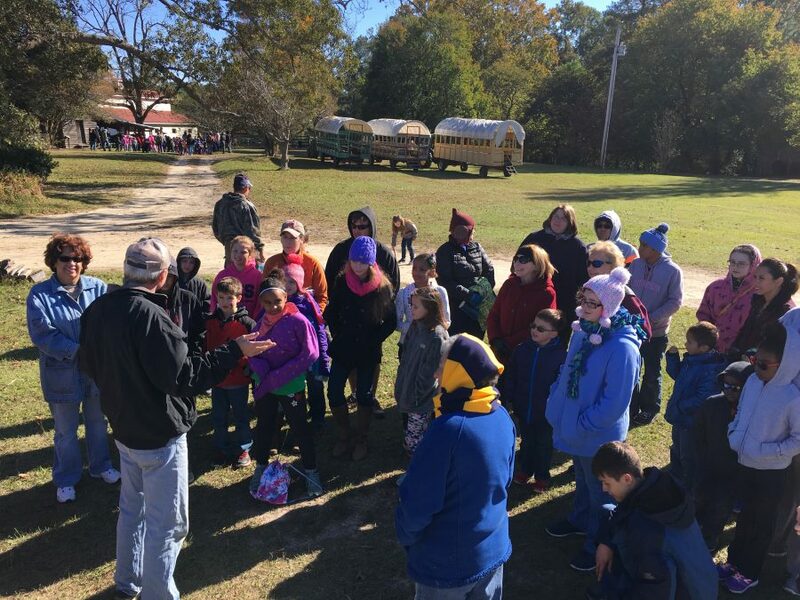 The group leaders chose a Monday in October when kids were out of school. As the day got closer, so did the forecast: 38 degrees and windy. Our fear was that this would keep a lot of the kids at home and inside but we were completely wrong. 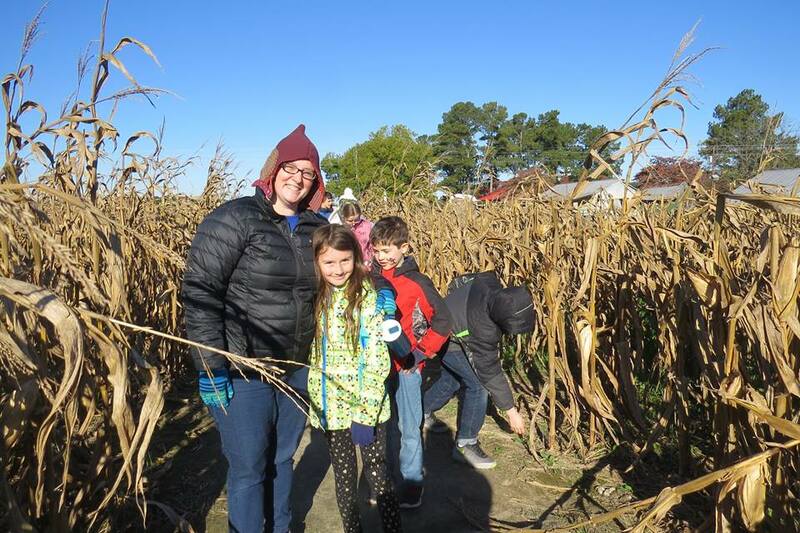 By 9 that morning Gillis Hill Farm was greeted by a huge group of volunteers, parents and children all bundled up and peering out across a field of collards. 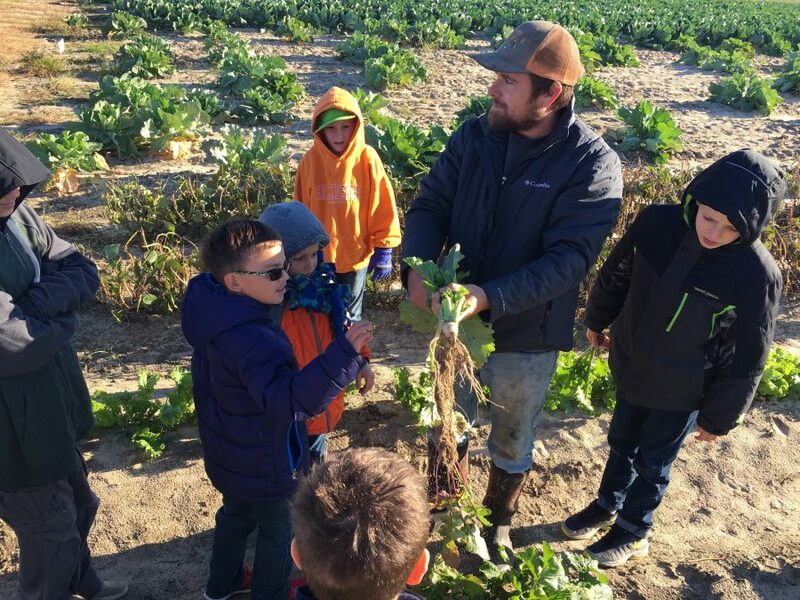 It was all the parents could do to temper the excitement of their children long enough for William Gillis to explain how cool-season vegetables are grown. Next was a lesson on strawberries. “Strawberries are planted in October?” asked one junior master gardener. “That’s right,” Gillis said. “What is the plastic used for?” asked Molly Barbour. 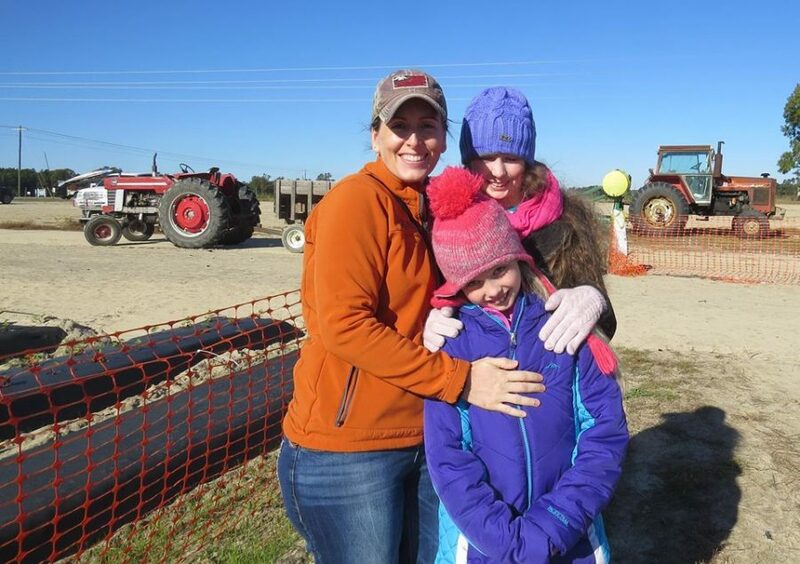 “The plastic prevents weeds from growing and helps keep the soil moist,” Gillis told her. The group of nearly fifty people was then divided in half. 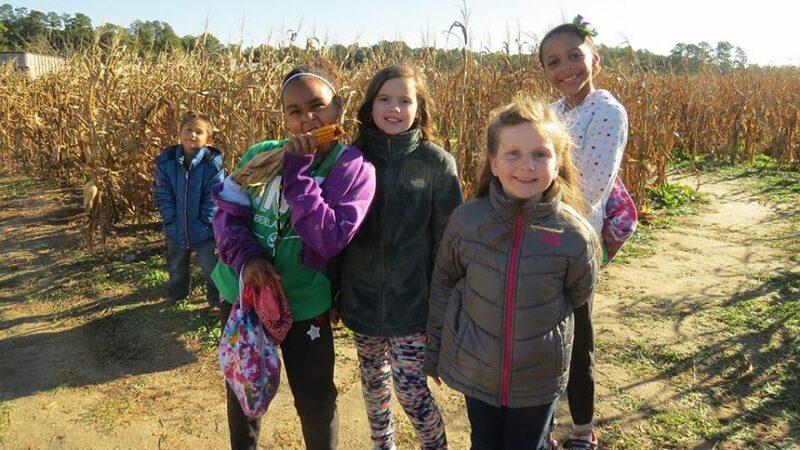 One group sprinted through a corn maze while the others hopped on a hay ride and took a tour of cattle, goats and chickens. “Stay together and stay warm!” shouted several parents and volunteers. But the kids were so wrapped up in the experience I’m not sure they heard the advice. 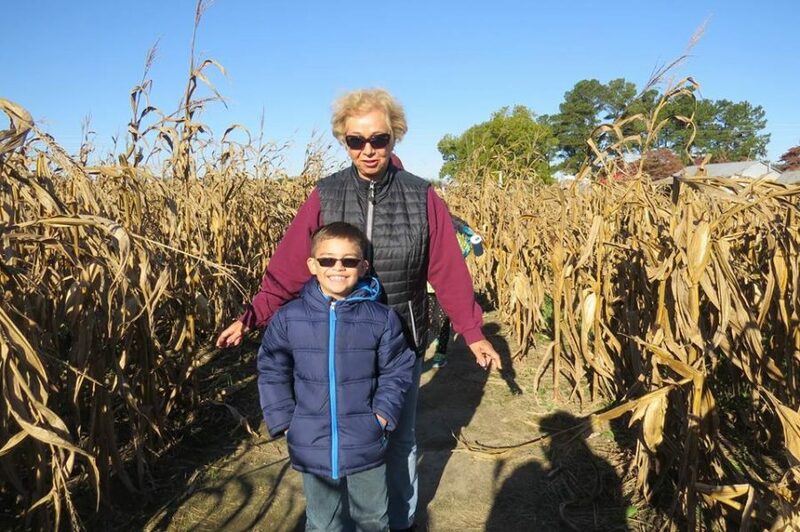 One boy told a friend his grandmother has a garden. “My grandfather has cows,” his friend replied. “We go to see them every summer.” I thought to myself: what a blessing that sort of thing still goes on. But for many children, walking through a cow pasture is not a part of their daily routine. 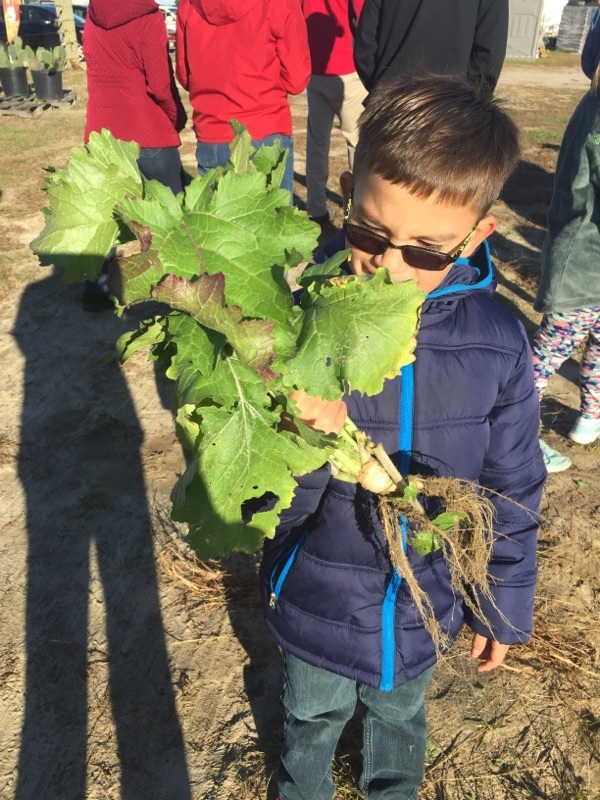 Pulling turnips out of the soil is not typical. Neither is hearing a rooster crow, or taking a bumpy hay ride through the woods. 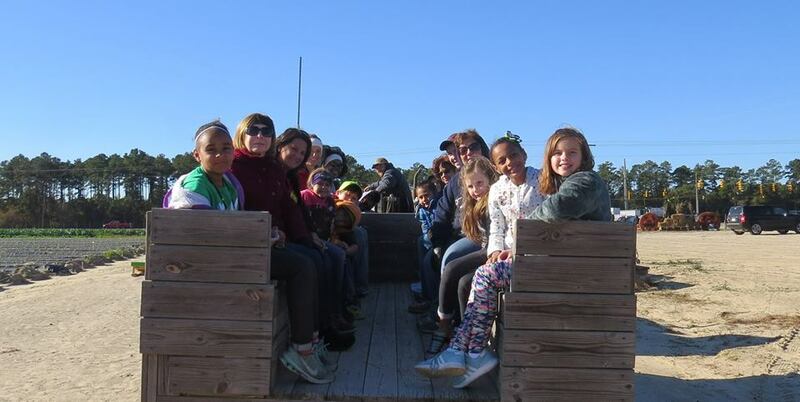 After a tour of the farm, the junior master gardeners headed back to the Gillis Hill Produce Stand. 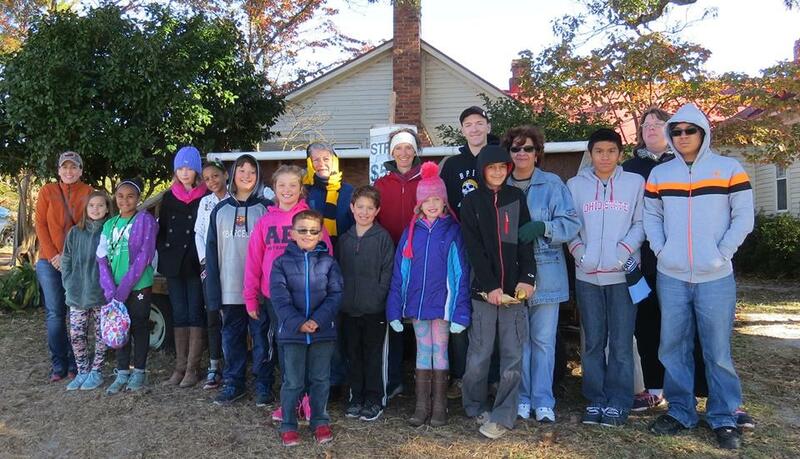 They were greeted with a warm cookie, a cup of hot apple cider and of course… a pumpkin. “What was your favorite part about today?” I asked a few of the kids. “Learning about all the different plants and their seasons!” Mikayla said. 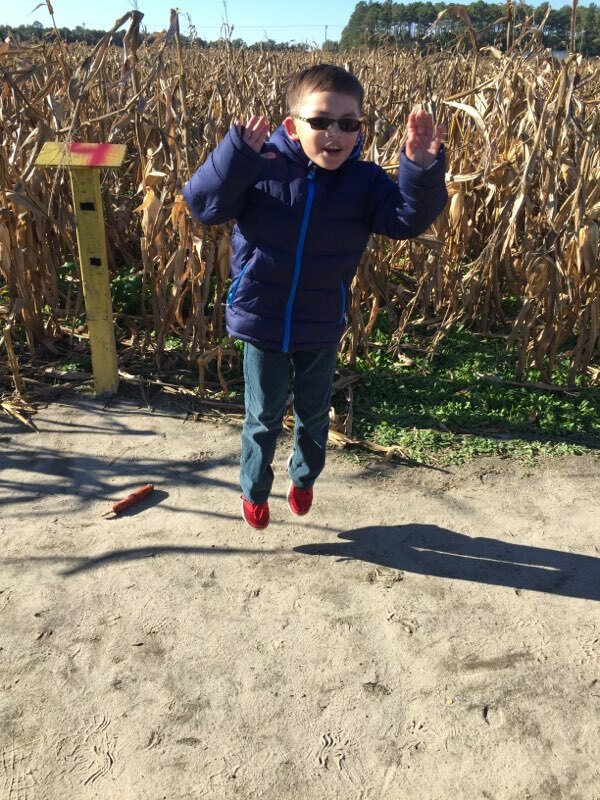 “CORN MAZE!” yelled Kyrian, “Being outside with nature!” Miya said, with a smile. As we were leaving, a boy named Gannon looked up at me and said, “You know what my favorite part was? Everything!” I would have to agree with Gannon. 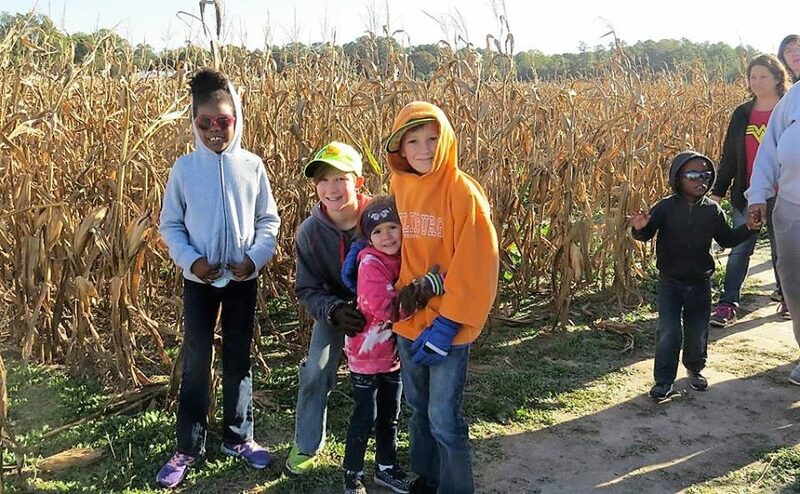 The Junior Master Gardener Club is a nonprofit 4-H club that gives children in Cumberland County something extremely valuable: education and experience. 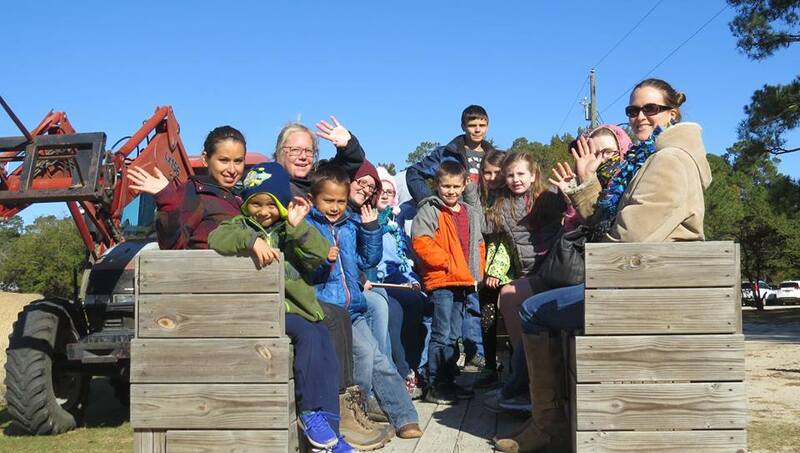 Please support the extension master gardener volunteers in this pursuit by donating or nominating a child to become a member of the club. 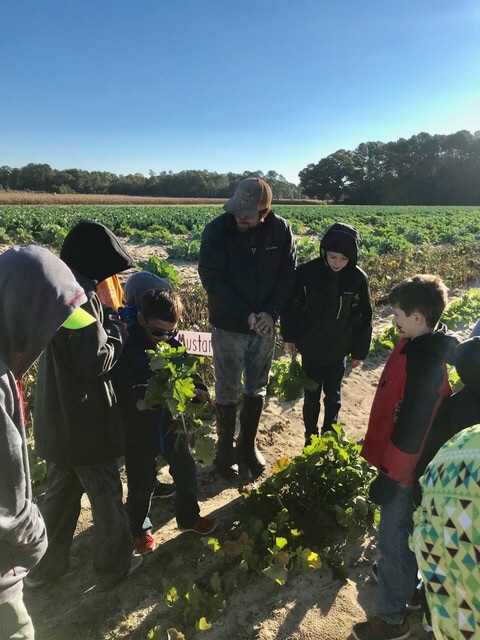 Jason Weathington is an urban agriculture extension agent at the North Carolina Cooperative Extension’s Cumberland County Center. 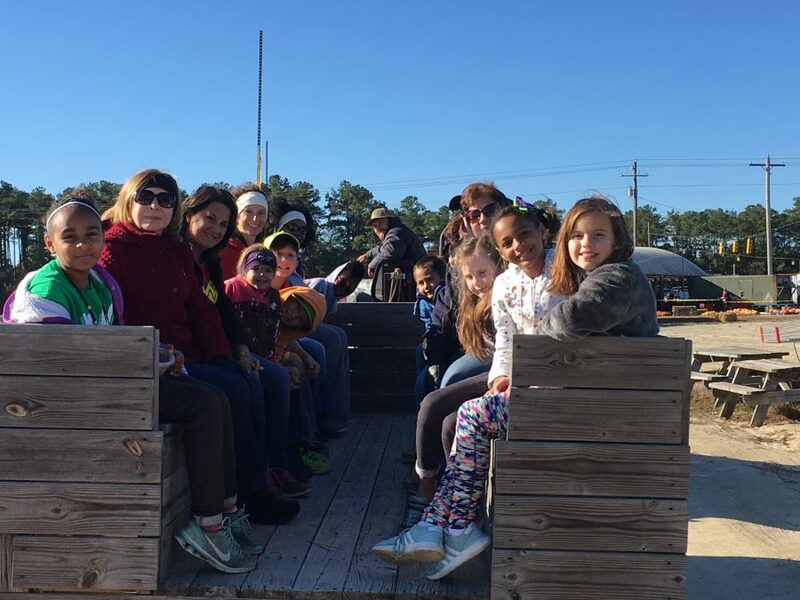 For information about the center’s 4-H program, visit bit.ly/2zE5ivl.